There’s a lot of very serious abuse (at least institutional) surrounding the UPC, much like in those ‘trade’ agreements with all the confirmed bribes. The UPC should be at least as scandalous as ACTA or the TPP, but the public is hardly aware of the UPC, there’s no public input on it, and the driving forces behind it typically work behind closed doors (or in private events with high fees to attend and no input from critics). The UPC is driven not by public demand but by the desire of some parties to essentially loot the public. It’s like legalised theft, or systematic passage of wealth.The EPO has its own lobbyists Brussels and so do EPO allies like Microsoft, which employs Microsoft-connected lobbying groups in Brussels (for software patents in Europe — a goal evidently shared by the Battistelli-led EPO). Does anyone know who funds the front/lobbying group “Fair Standards Alliance”? They don’t say, but we can make guesses. Curiously enough, yesterday we found out that the legal firm that the EPO hired (i.e. paid) to bully me with legal letters is boosting the UPC right now. Well, another coincidence or alignment/intersection of interests? MIP wrote that in its partially-visible article (behind paywall). 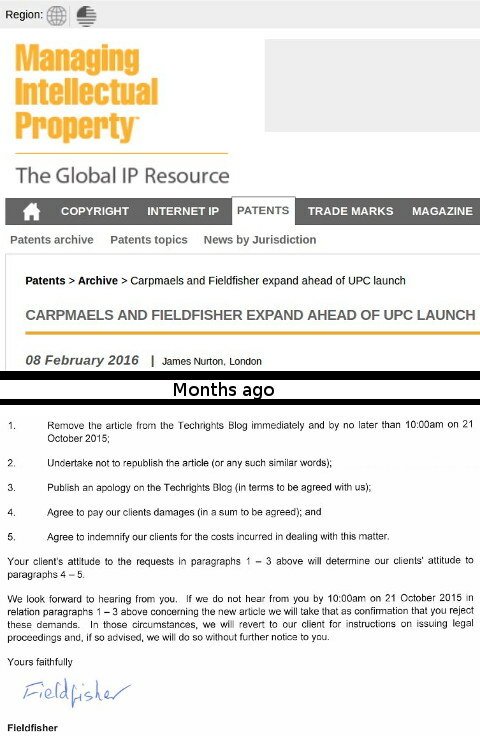 “Fieldfisher expand ahead of UPC launch,” it says, and all I know Fieldfisher for is threatening legal letters that it sent me. Articles which highlighted the connection between Microsoft and the EPO is what they threatened me over, repeatedly. As it turns out, based on yesterday’s tweet from the FFII’s President, the “German Ministry of Justice seems to prepare for UPC ratification, software patents like a letter to the post #swpat #nodebate” (indeed, no public debate at all, same as in the UK). Its sections I. and II. describe a remarkable connection between the German Ministry of Justice and one of the leading German pro-UPC proponents, Prof. Tilmann (http://www.hoganlovells.com/winfried-tilmann/), a preeminent German attorney at Hogan Lovells, one of the leading patent litigation firms in Europe. Tilmann admitted that he had been given confidential court documents by the Ministry of Justice to publicly comment on these in favour of the UPC. The article also cites a letter sent by his firm to a Committee of the House of Commons in 2012, trying to clarify that Mr Tilmann was not acting on behalf of Hogan Lovells, but was merely providing “his own personal views” – after he had apparently pushed his lobbying for the unitary patent and UPC a little too far. The letter was mentioned on the IPKat (http://ipkitten.blogspot.com/2012/05/when-unity-creates-division-kat-patent.html), it can be downloaded here (https://sites.google.com/site/ipkatreaders/unifiedpatentproposal/hoglove.pdf?attredirects=0&d=1). It is still a good laugh. It seems possible that the only reason the European public has not yet scandalised the UPC is the secrecy around it, the lack of understanding (the EPO spends money on pro-UPC propaganda events), and lack of public participation. Software Patents: Dying, Spreading, or Hardly Surviving?